It seems that bulls are taking the control of the GBPUSD chart due to negative USA macroeconomic data. Moreover the 10-y government bond yields reports of these two countries are getting closer to each other which strengthens GBP. The rising pattern will continue for today creating strong resistance at 1.4467 to prevent the pair from further growth. The pair is climbing the ascendant channel. 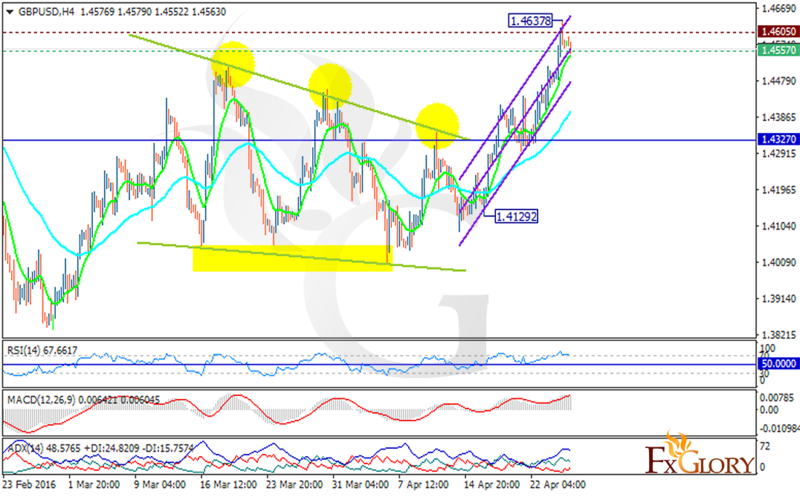 The support rests at 1.45570 with resistance at 1.46050 which both lines are above the weekly pivot point at 1.43270. The EMA of 10 is located above the EMA of 50 which indicates stronger GBP in the recent days. The RSI is above the 50 level and the MACD indicator is in positive territory showing the price growth. The ADX is showing stronger buyers than sellers. Long positions are recommended with the target at 1.4760.